GUEST EXCLUSIVE: Stereotypes and us!! | Precious Thoughts! GUEST EXCLUSIVE: Stereotypes and us!! It is difficult to write about this one- not that one enjoys writing anyway- but writing about a thing where pangs of guilt as the victim and sometimes the wrongdoer periodically collide is not actually the most enjoyable activity to do. Ha, where do I start? 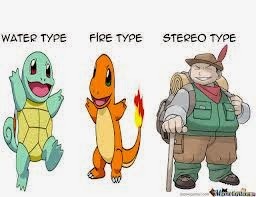 Stereotype. Why do we stereotype, often with so much ease, comfort and unabashed audacity? That black is bad and white is good- why is that a preconceived theory in many of us? Why? Ok, ignorance, many seem to argue, is the main reason and I remember a recent event that perhaps gives credence to that school of thought. And yes, my brother, I realise that one could stereotype with a positive intention (stereotypes could be valid, I know) – but that does not mean it is completely right. The problem with stereotyping- or at least the most dominant one- is that it gives you a single face of a thing and projects it as the only undiluted, unaltered face. And we all, if we want to be honest, have at least an experience of this projection. Ok my sister, let me tell you one recent experience. My own experience. It was an evening. I remember that evening, it was six; perhaps seven o’clock, the period of the day for most when the siblings of hunger and tiredness surfaced. I had just arrived home, famished, you could almost hear the walls of my stomach contract painfully. It had been running on empty for most of the day. The doorbell rang behind me and I opened it to behold the pretty face and figure of a Caucasian blonde silhouetted at my doorway. ‘Can I speak to you for a moment’?, she asked. Well, if anyone can, with those admirable features of yours certainly you’ll be top of the list, I replied. Ok, that wasn’t the actual reply, but a weak smile and nod was my reply. You see, I was still hungry. Then she started speaking. She was a volunteer, representing a charity organisation assisting the needy in various countries across the world. It was a large organisation, ubiquitous across developing regions, and it had hundreds volunteers- trained professionals of relevant fields- helping out. And they survived on generous donations from kind members of the public. She was calm, she was articulate, she was knowledgeable, she was passionate, spewing out possibly hundreds of words per minute- the perfect salesperson. No, I must find a loophole using a strength- details. You see, I am a bit too competitive. Where are your volunteers working, what specific countries, I asked. Her face lit up, obviously fully aware of the answers. ‘Oh, countries like India, Pakistan, Sri Lanka, Indonesia, Africa….’. ‘Africa’, she reeled out as from an imaginary list, her countenance now overcome with a seeming default sense of pity and sadness. Well, she could have continued if I did not stop her- of course I wouldn’t miss that opportunity to offer an education. ‘Countries like Africa you say?’, I queried. ‘Yes’, she replied oblivious of the new course of the conversation, ‘we have volunteers in Africa, they need food, water and medicine…’. Pity, more natural pity from her. I cringed. She had fallen guilty of stereotyping the continent of Africa as one country, with all parts of the ‘country’ in need of food, water and medicine. All parts of it struggling to survive, needing and surviving on kind volunteers from thousands of miles away. ‘Well, that’s wrong’, I started. ‘Africa is not a country. It is a continent of 53 different countries’. My tone was a bit forceful, instructive. But her eyes lit up, willing to learn. So I tell her more. You see, that thing called stereotype, that often initial and sustained practice of using one side of a thing to represent the whole has somehow stuck with mankind for a while. A long while. I remember- in my first zoo visit as a child- checking to see if I can notice the cleverness and craftiness of ‘mbe’ the tortoise- as the children storybooks I read had described it as cunning, wiry and dishonest. Of course it wasn’t- or rather I couldn’t see it from merely looking. Or gazing with careful concern, if I could see the ‘proudness’ of the colourful peacock, because the books I had read said it was so. Well, I couldn’t. These are things I recall, rather hilariously anyway. It goes further. I remember being questioned in my first place of student internship why my English Language was apparently so good and thought process apparently good too. It wasn’t consistent with the belief my superiors had, that the Northern part of Nigeria- where I had my initial education- had students in schools who were totally inept at every strand of learning. Or why I wasn’t ‘quiet’ and ‘reserved’ in team meetings. At that time, I was defensive and understandably so- what else is more preposterous as ignorant stereotypes? Reflecting on those incidents, I would have treated them with perhaps, some genuine sense of pity. Stereotypes are usually preconceived; a story a person knows about a thing without actually having an experience with the thing. and to insist on only one story about a thing so strongly, isn’t just right. You see, I struggled with stereotypes while growing as a child; prejudice and other forms of discrimination still faced me much later, but none as frequent as being a victim of first hand stereotype. Hence my understanding of the mind of the perpetrator- usually ignorant – and the silent sufferings of the victims. And I understood my new friend; she listened, she smiled and she accepted the new education. More importantly she accepted that it is right and important for one to challenge stereotype where they exist, and correct them. She accepted that while this may be a difficult task, owing to the huge influence of the media on our minds, in one’s small sphere of influence such correction can be made, one at time. She accepted that in the face of more persuasive information, the stereotyped mind can be aligned to what is right. She accepted that she has a duty, armed with the right information, to challenge stereotypes. And she did promised me that she would do just that. It was a win-win at the end. I was delighted that I had changed a mindset and she was delighted that she had received some real information- and the donation from me! Lovely Lovely! post some folks out there really need to know about Africa and distort this ugly picture projected into their minds by their media. I couldn't agree more… Generally, looking at 'things/situations/people' with a stereotypical mindset distorts the reality of the situation/thing/people. Another form of stereotyping is gender-stereotyping. This is when we attribute certain soceital roles to people by virtue of their Gender even though when we consider the ability of both sexes its not true. I.e: A woman's place is in the kitchen, men don't cry.